To display your data correctly, each data frame uses a coordinate system. It determines the map projection for the map display in the data frame. The data frame's coordinate system need not be the same as the data you are using, although if ArcMap has to project your data on the fly, it can take longer to draw. When ArcMap is started with a new, empty map, the coordinate system for the default data frame is not defined. The first layer added to an empty data frame sets the coordinate system for the data frame, but you can change it if necessary. As you add subsequent layers, they are automatically displayed using the data frame's coordinate system as long as the data source's coordinate system is defined. If there isn't enough information, ArcMap will be unable to project the data in each layer and display it correctly. In this case, you'll have to supply the necessary coordinate system information yourself. Generally, if you have a layer whose dataset does not have a coordinate system defined and you know which coordinate system it is using, you should use the Define Projection tool in ArcToolbox to assign projection information to your data. This is required for working with that data in ArcGIS. To see if your data source has a coordinate system defined, right-click the layer in the ArcMap table of contents, and click Properties to open the Layer Properties dialog box. Click the Source tab, then look in the Data Source box. You can also use the Catalog window to see if your data has a coordinate system defined. You can review and set the data frame's coordinate system from the Coordinate System tab on the Data Frame Properties dialog box. To set the coordinate system of a data frame, you must not currently be editing. To end your editing session, click Stop Editingfrom the Editor menu. Right-click the data frame name and choose Properties to bring up the Data Frame Properties dialog box. The Spatial Filter filters the list of coordinate systems based on the extent provided, whether it be the Current Visible Extent, an Outline of Features, an Outline of Selected Graphics, or a Custom Extent. The String Filter filters the list of coordinate systems based on folder names, coordinate system names, or well-known ids (WKID). 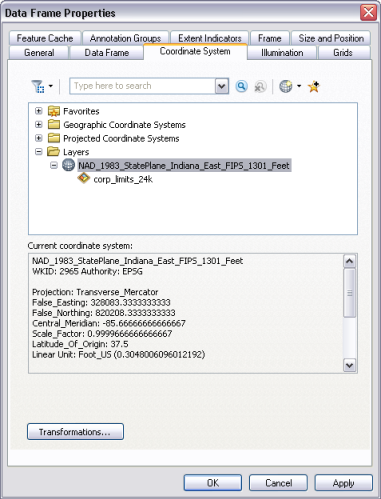 When using the filter options to reduce the number of available coordinate systems, only the folders containing the matching coordinate systems will appear. Once you have located the coordinate system you can add it to your Favorites folder by clicking the Add To Favorites button or right-clicking on it and selecting Add To Favorites. The physical location of this folder is the Application Data\ESRI\Desktop<Version Number>\ArcMap\Coordinate Systems folder in your Windows profiles directory. To set the data frame coordinate system to be the same as a particular layer in the data frame, open the Layers folder and select the coordinate system. Once the coordinate system is expanded, you will see the layers that reference it. To set the data frame coordinate system to be the same as a layer that is not in the data frame, click the Add Coordinate System drop-down menu, select Import, and browse to a data source that is defined with the coordinate system you want to use. Using Import you can also import previously saved .prj files. You can create a new coordinate system by clicking the Add Coordinate System drop-down menu, and selecting New. You can also modify parameters of an existing coordinate system by right-clicking it and selecting Modify Item. Coordinate systems created with either of these methods will be displayed in the Custom folder. Changing the coordinate system of a data frame doesn't alter the coordinate systems of the source data in the data frame. To specify a geographic transformation for the data, click the Transformations button and select the desired transformation, or create a custom or compound transformation. The map units are the units in which the layers in the data frame are displayed and used. The map units are determined by the data frame's coordinate system. Once a coordinate system has been specified for the data frame, the map units cannot be changed unless you choose a different coordinate system for the data frame or modify the existing coordinate system's linear units. If the data frame is using a projected coordinate system, the map units will be the linear unit of the chosen projected coordinate system, such as feet or meters. If the data frame is using a geographic coordinate system (in other words, the data frame is not projected), the map units will be the angular (spherical) unit of the geographical coordinate system, usually Decimal Degrees. The map units will be shown as unknown until the coordinate system is specified for the data frame. If the data frame contains no data, add your first layer to the data frame, which will set the coordinate system automatically. The data frame's display units default to being the same as the map units but can be changed at any time. The display units are used by the Measure tool, provide the default units used by scale bars, and are the units in which the map coordinate readout and the area and dimensions of graphics you draw are shown in the status bar. The feet, miles, and yards listed here are US survey units, so they are US Survey Feet, US Survey Miles, and US Survey Yards. The imperial or international versions of these units are not supported as display units, although both versions of these units are supported in ArcGIS projected coordinate system definitions. You can change the Map and Display units on the Data Frame Properties dialog box. Right-click the data frame name in the table of contents and click Properties. Click the General tab. You can see the current Map units and also set the Display units. You can also set additional coordinate display properties for the status bar by clicking Customize > ArcMap Options on the main menu and clicking on the Data View tab. You can also specify that the XY coordinate readout will be in different units than the display units. For example, if you want the length of graphic lines that you draw on your map to be shown in the status bar in miles, but you want the XY coordinate readout to be in decimal degrees, set the display units to be miles here, then go to the Data View tab on the ArcMap Options dialog box, and choose the option to use decimal degrees instead of display units for the coordinate display. 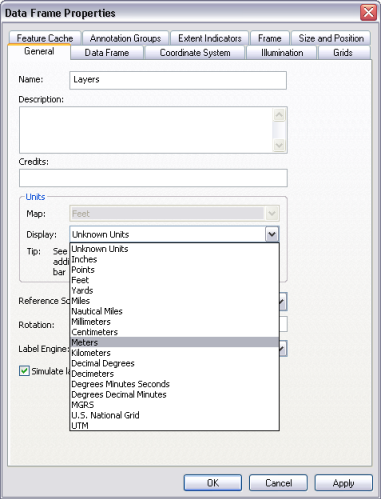 Note that settings you make in the ArcMap Options dialog box apply to all the data frames in your map document.